Valentine Joe Strudwick (pupil 1903 – c.1913) St Paul’s School’s Boy Soldier A major embarrassment to the military authorities during the First World War was the presence of boy soldiers at the Front. Officially, the minimum age for army recruits was 19, but children as young as 13 are known to have joined up, lying about their age in order to fight in the trenches against Germany. One such young recruit was Valentine Joe Strudwick. Born on 14 February 1900, Joe was the second of six surviving children of Jesse Strudwick, a gardener, and his second wife Louisa (nee Fuller), a laundress. Jesse’s first wife, Ellen, had died leaving him with two small daughters – stepsisters to Joe. When Joe was born the family lived in Falkland Road, moving later to Orchard Road. At the tender age of three Joe started at the Falkland Road Infants’ School, the Infants’ School that had merged with St Paul’s School in 1896, and he transferred to St Paul’s School at the age of eight, where he would most likely have stayed until the age of 13. After leaving school, Joe is thought to have worked for his uncle, a local coal merchant. He may also have been a farm hand at a smallholding behind St Paul’s School near the Glory Wood. Like many others, however, Joe must have been struck by the persuasive recruitment campaigns run by the British Government from 1914 onwards – poster campaigns designed to encourage men to join up and serve their country. Hundreds of thousands answered the Government’s call, including many young men who thought that army life would provide opportunities for travel and work that were not available at home. Some even thought it would be fun. 2 In January 1915, aged just 14, Joe enlisted, joining the 8th Battalion the Rifle Brigade, part of the 14th (Light) Division – the battalion for volunteer soldiers. He was most probably trained at Winchester, and after only a few weeks’ preparation he was sent, with his Battalion, to the trenches at Boezinge near Ypres in Belgium. Conditions in the trenches were horrendous. They were muddy and filthy. Constant shellfire from enemy lines across ‘no man’s land’ meant soldiers died on a daily basis. Thousands more died in the major battles for the nearby town of Ypres. 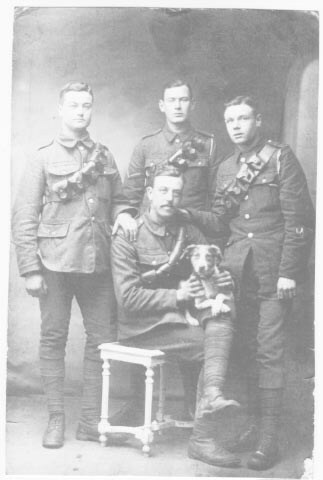 Joe died on 14 January 1916, not in any major battle but in the daily rounds of firing between Germany and the Allies. He was just 15 years, 11 months old. He is buried in Essex Farm Cemetery, near Ypres, and honoured on the Rolls of Honour in both St Paul’s and St Martin’s churches, and on the War Memorial in South Street. Dorking War Memorial, South Street Joe’s death has become a symbol of the lunacy of the First World War and the shameful use of such young boys at the Front. His grave is now one of the most visited in any of the First World War cemeteries. Essex Farm Cemetery – then Essex Farm Cemetery – now HMW June 2011 3. An historian is hoping that during the centenary of the First World War a road in Dorking will be named after one of its youngest casualties who grew up in the town. 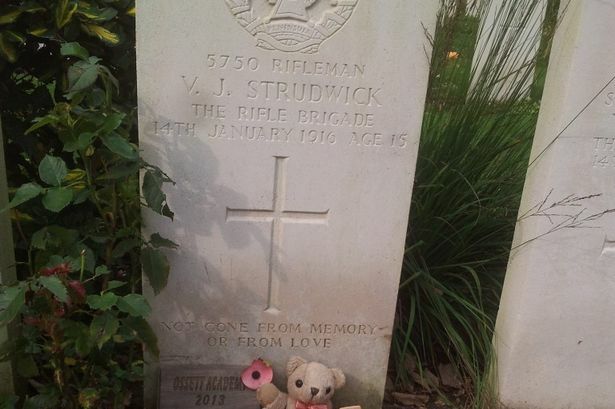 In an effort to commemorate all the soldiers who fought in both the First and Second World War, Andy Thompson would like a new road named after Valentine Joe Strudwick, who was 15 when he was believed to be shot by a sniper’s bullet in Belgium, in 1916. Born in Dorking on Valentine’s Day, Joe, as he is more commonly referred to, first lived on Falkland Road, and later moved to Orchard Road. Mr Thompson, who runs tours of the battlefields, said that as the son of a farm labourer, Joe looked a lot older than he actually was, and after the war broke out, he walked to a recruitment office in Whitehall from Croydon to enlist. “They said he was too young,” Mr Thompson said. “He went back the next day and lied and said he was in fact 17. Joe’s family did not hear from him until word got back that he was wounded in January 1916, fighting near Belgium. “My information was that he was wounded by a sniper,” Mr Thompson said. “He got back to the advance dressing station at Essex Farm, and they stabilised the wound. His father, Jepe, got to Dover to get to France and collect Joe when he was told he had in fact died. The family opted for him to be sent back to Essex Farm near Ypres where the wounded members of his unit where buried, as it was custom for soldiers to be buried where they died or with their comrades. Mr Thompson has now taken on a campaign to get a road named after Joe, and also another Dorking soldier, Charles Graham Robertson, who served in both World Wars and was awarded the Victoria Cross. He has been in talks with Mole valley District Council about it. He said it would be appropriate given the centenary, and the centenary of the death of Strudwick in two years’, time to have a new road, perhaps one built due to a new development, named after him. “I said I would pay the equivalent of getting a blue plaque, something to explain to people the history of Strudwick and Robertson, I would fund that personally,” Mr Thompson said. “The council said that wouldn’t be necessary, but I would be happy to pay and fund if necessary so people, children, know. He said the reason Strudwick strikes a chord with youngsters is because they can relate to him, as he was not someone in his 20s, 30s or 40s. “He is somebody who could have been them, and like them Strudwick and all young people had aspirations,” Mr Thompson said. Richard Burrows, corporate head of service at Mole Valley District Council, said: “The council maintains a list of suggested street names which are shared with developers and this suggestion has been included on that list. “MVDC would welcome any similar request made which holds local and/or historical significance, particularly those honouring the 100th anniversary of the outbreak of the First World War.